As protein comes into the rumen, it is broken down into peptides and then further digested into amino acids. The amino acids available to ruminal microbes are utilized directly or deaminated to yield carbon skeletons and ammonia. Particles of AminoMax Pro, however, are kept intact in the rumen and remain suspended in ruminal fluid until they are passed into the lower GI. This bypass method allows AminoMax Pro to deliver consistently high levels of bioavailable lysine, methionine and other essential amino acids to your dairy cattle, allowing your herd to produce more milk with higher milk components. Click on the image to zoom in for an in-depth look at how AminoMax Pro bypass amino acids work. AminoMax Pro is a plant-based bypass protein supplement designed to deliver an amino acid profile customized for lactating dairy cows. The blend combines canola meal and soybean meal, which both contain amino acids that have been shown in university research to stimulate milk production and milk quality. 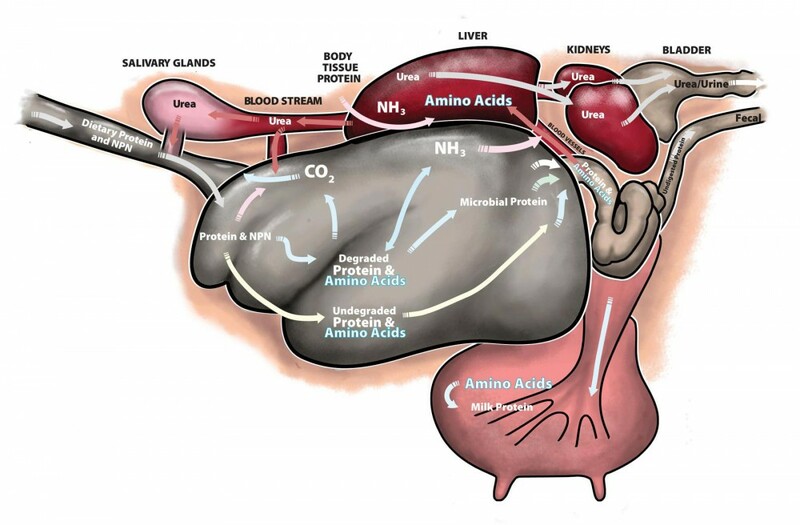 Because the bypass amino acid requirements of dairy cattle are consistently met with AminoMax Pro, your nutritionist can reduce the amount of crude protein in the diet to maximize the use of forages and fermentable carbohydrates.